I have experimented with a number of soldering mediums and techniques. The following tips are from my own personal preference. They are by no means the only way to accomplish the goal of joining two pieces of metal. I offer this information as a courtesy. You may find that you prefer other methods. This just happens to be what has worked best for me. There are a several different forms of solder: solder wire and rosin, rosin core solder wire, and pre-fluxed solder paste. I use different mediums depending on what I am trying to accomplish. The rosin core solder wire is my favorite for most applications. But if I am trying to get in between two pieces of metal, such as a metal base and an ear clip, I prefer to use the solder paste. All you need is a butane torch, some solder paste or rosin core solder wire, and a base to solder on. Your base needs to be something that will not burn; a brick or ceramic tile works well. If you are grouping rhinestone settings or rhinestone chain together, you will need something to hold them in place. There are a number of items on the market for this. There is a "J" board (which I like but it generally arrives broken and it can continue to burn and I feel that it can be a fire hazard), and there are also clays that are specifically made for soldering. However, I have found that Play-Do or any of the off-brand modeling doughs work great and are very inexpensive. You need to be in a well ventilated area. As a safety precaution, you should wear a mask and goggles. You will also find that you need some old pliers to handle your work. The pieces will get very hot and you can easily burn yourself. 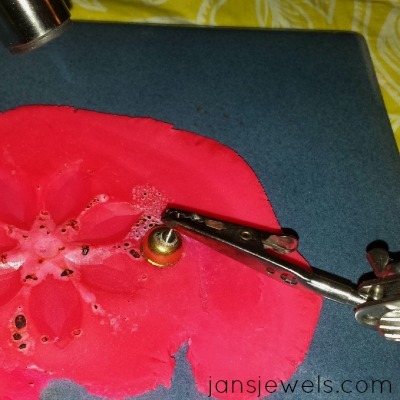 If you are soldering rhinestones together to make a rhinestone necklace, brooch, pendant, earrings, etc., simply roll out your dough on a ceramic tile until you have a flat surface that is large enough for your design. 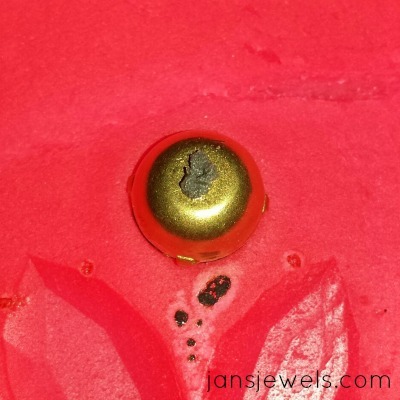 I prefer to pre-set my stones due to the fact that the stones are generally a little larger than the settings and if you get your settings too close to one another, you will not be able to set the stones after you do the solder work. Another risk in not setting the stones first is that you can easily solder the prongs together. However, there is also a risk in pre-setting your stones. If you apply the flame to any given area too long, you risk ruining the stones. This is something you may want to play around with for a while and get the hang of. If you want to solder without the stones, make sure you have allowed plenty of space for the stones. Take your design and place it face down in the dough making sure the top of the settings (the entire length of the prongs) are all the way down in the dough. Don't push them down too far or the dough will act as insulation and you will not be able to heat up the metal enough to melt the solder. 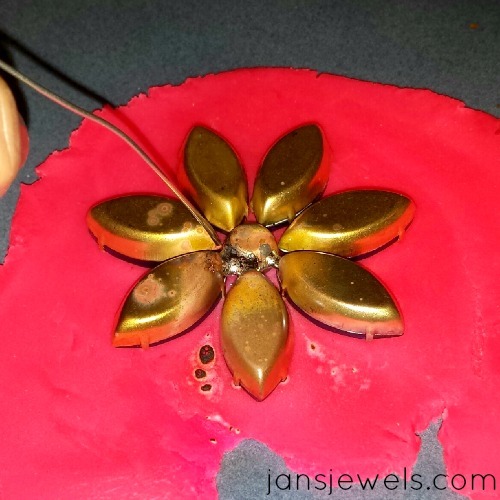 If you are incorporating rhinestone chain in your design, you need to be careful not to push them down into the clay very far. Generally they will barely be in the clay at all. Once you have your design laid out, cut off an approximately 16" piece of solder wire and grab your torch and start applying heat to one area of the settings. When it is hot enough, pull the flame away and just touch one setting with the tip of the solder wire and drag the solder over to the other setting to create a bridge between the two. Sometimes if the metal is hot enough (generally this is the case with smaller settings), you can make a few connections (bridges) before you need to apply more heat. Just continue this process until all of your pieces have a connection. If you want to join two pieces of metal together, for example a filigree base or your soldered piece with an earring post, you simply place a small amount of solder paste on the spot where you want the post. 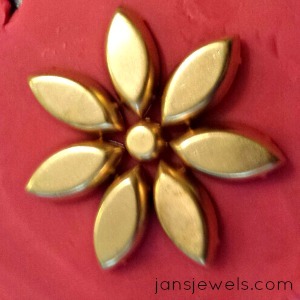 (Note* If you are soldering on a previously soldered piece, you will want to cover the solder joints in modeling clay so that you don't re-melt the solder from your previous work). Place the post on your base piece (it helps to have a third hand to hold the piece in place), and slowly heat the area where you have applied the solder paste with the torch. The flame should be about 6” away from what you are soldering. When you apply the heat, you will first see a little bit of flux run out, and the paste will turn a bright silver color. This generally takes only a few seconds. TIP: Move the torch back and forth along the length of the pin back or piece that you are soldering. To get a good solder joint the metal must be hot enough for the solder to flow to it. At the correct temperature the solder will turn a bright silver and flow to the metal. Remove the flame and let cool. TIP: When using the solder wire I usually try to do it quickly and add as much heat as possible. So, I am generally applying heat about 2" away from my work. With the solder paste, I generally try to keep the flame about 4" to 6" away from my work. 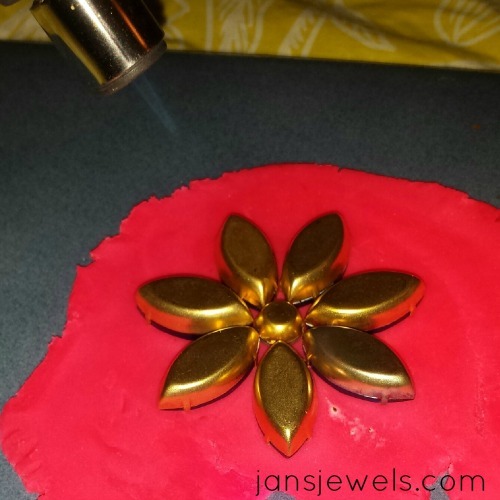 The heat will often discolor the metal and the paste will splatter if it gets too hot. The solder paste can be used in a syringe. However, I have found that the buildup of air pressure causes you to waste a lot of paste. I generally put a little paste on a plastic lid and use a tooth pick or dental tool to dab the solder on. TIP: The solder paste can dry out. It is best to take out what you need and then replace the lid. Store the jar of solder paste in a sealed plastic bag. Soldering may discolor your metal. Sometimes the discoloration is permanent, but many times you can polish the metal back to its original color. Your soldered pieces will have an oily residue after they have been soldered. You can clean them with soap and water. Only thoroughly cleaned pieces should be sent out for plating. If you don't want to go to the expense of plating, you can paint the entire piece with an enamel paint, or if you like the color of the soldered piece, you can hide the little bit of solder that shows by using a brass colored enamel paint along the edge of the solder. I recently found that the solder paste and wire that we carry melts at such a low temperature that you can solder with a craft heat gun. Just use the same process as above. While it does take a little longer, using a heat gun is great option for those that are sensitive to the fumes created from a butane torch or cannot use an open flame due to medical reasons or safety precautions. 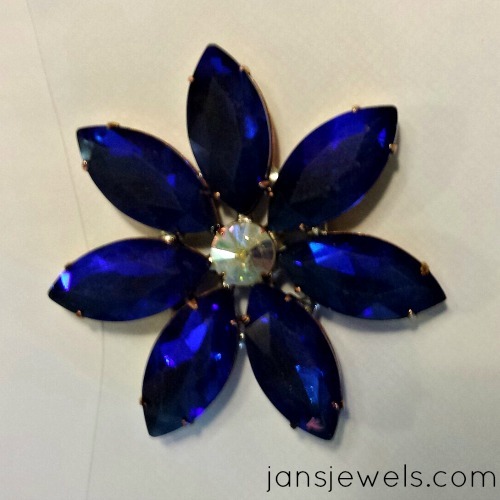 TIP: If you want to use stones that have been colored with Iced Enamels, do the solder work before coloring the stones. It’s really best to color the stones outside of the settings, as applying heat to the already soldered settings will risk re-melting the solder joint.